With little in the way of immediate context, this flat plane of marsh fill, bound on all sides by freeway and adjacent to a sewage treatment plant, needed to be re-envisioned as a vectorial nexus. 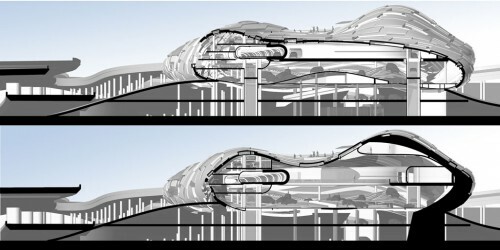 With this in mind I designated a series of vectors that my proposal would respond to: entrance, exit, view, wind (scent), and the creation of a dedicated mile long test track that cuts through the building. The track is modeled in direct quotation to local off and on ramps, providing an idealized yet realistic driving experience. It is lifted level to the adjacent freeway; the simple act of driving a new car becomes intensely seductive when juxtaposed with rush hour traffic. New cars are brought to the site via dedicated freight train track cutting through artificial ground. They are then moved via six elevators to a massive vertical storage configuration within the building. These vectors along with programmatic needs became the guiding framework to deform a simple tessellated sphere into a “high performance” blob. Using a simple script each panel in the now-deformed tessellation was randomly extruded between zero and three feet. Glazing was applied to all panels from .1-1′, a hollow panel to those from 1.1-2′, and a clerestory window to those 2.1′-3′. This random arrangement became baseline data for further manipulation to acknowledge program needs.